"I have so much fun playing this game. It is very challenging. I particularly like the word fill-in. I have been increasing my scores every time I play. Some of the scenes are particularly hard and I love going back and trying to conquer them. The scenery in the puzzles is beautiful." This just might just be the best Clutter yet. Explore 12 mines filled with clutter, slider, box quote puzzles and more. Clutter V: Welcome to Clutterville introduces a never-ending, fast and furious version of Clutter, plus over 100 levels in just the main quest alone. Whether it's Classic Clutter, Brick Blockers or Close Counts, there is something here for everyone. 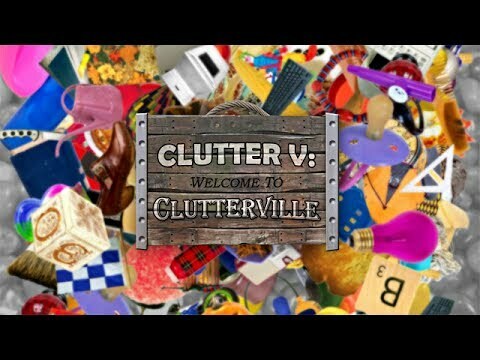 Featuring innovative modes and music, over 75 picture and box quotes puzzles, and randomly generated levels with endless replayability, Clutter V: Welcome to Clutterville will challenge your sense of reality. I love all the Clutter games. They are what Hidden Object games use to be like before they added the adventure stuff. I wish there were more games where you just find hidden objects or Clutter games like this. They are the best! Enjoyed the game very much. Graphics were much better as well as time allowed for completion. So if Hidden Object games are your type of thing, I would honestly and wholeheartedly recommend the Clutter series. I like this game because it makes you really concentrate and work fast to avoid using all your time. I am 72 years and it is good for my brain! I enjoy all the Clutter games. It's a lot of fun looking for the matching pairs. I hope there are more Clutter games to come. I really this kind of game that requires concentration. It is fun to find objects and test matching skills. Plus, it reminds me how much we all collect that is so useless -- unless it is from a loved one, and therefore has value. I have enjoyed his quotations as well! It is amazing how something can be right in front of your nose and not see it. I enjoyed this game a lot. I thought it was fun. Wish there were more like this. I love Hidden Object games, but they mostly have scary themes rather than fun themes. A fun matching game to stimulate the brain. Well-designed and plays quite well. Match pairs of objects to remove them.